I hope everyone’s having a great week. 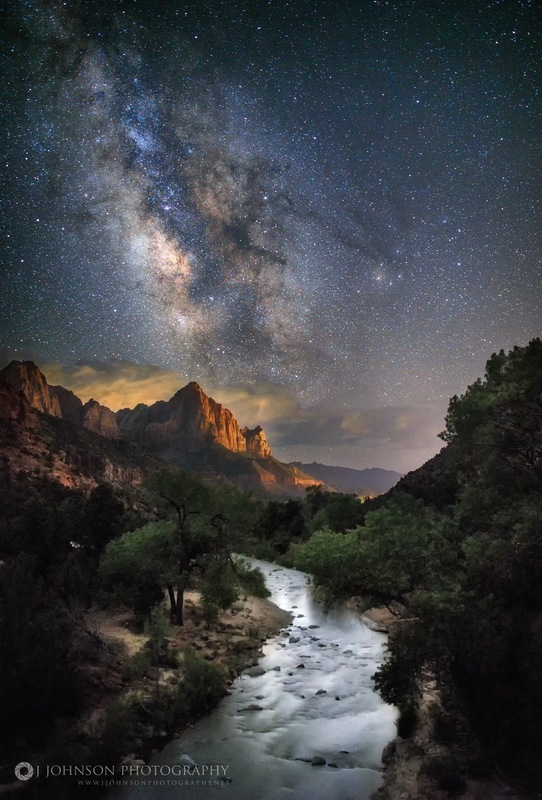 Let’s keep it rolling with this incredible image by Jeremy Johnson of the Milky Way rising over the Watchman and Virgin River in the beautiful Zion National Park. This is another place that I’d love to visit because one after another, the vistas that I’ve seen come out of Zion have been some of the best in the west. When I image, typically the foreground is more of a silhouette and the night sky seems to jump out of the darkness and although it looks great, it’s more to do with what I have for shooting opportunities, time and foreground options. This image caught here by Jeremy is what we night sky shooters live for because not only do you see the incredible night sky that we all admire, but we also have a calm, yet colorful and busy foreground. A foreground that you could just imagine standing in awe of day or night and this image brings them both together. Image | This entry was posted in Astrophotography (Wide Field), Galaxies, Images, People and tagged Astronomy, Astrophotography, DanSpace77, Galaxy, Jeremy Johnson, Jeremy Johnson Photography, Milky Way, Night Sky, Space, The Watchman, Zion, Zion National Park. Bookmark the permalink. This is absolutely stunning. Your commentary is perfect for the photo too!